Being a Commercial Roofer in Miami is a big deal to Hialeah Roof Repair. We know that any roofing process has it's challenges. Commercial Roofing is no different. We know that there are Local government standards and mandates and we are up to date on permitting for them and getting the job done. Knowing the process and being even more knowledgeable in local government issuance's, sets us apart as a Commercial Roofer. Although the size of the project may change our Customer Service does not. We are on point and consistent with Start date, Project Progress and Deadline communication. We know that getting the job done and done right, is your first priority. It's ours Too! We strategically plan each step of the process to coordinate the easiest possible plan to get you under a functional, budget friendly roof in as quick and painless a time frame as possible. Hialeah Roof Repair is a responsible firm that uses only quality materials and works with only the most consummate professionals like Newport Electricians. We map out the process and go over each layer with you, establishing the best possible outcome for your company. Being a Commercial Roofer is an added responsibility Hialeah Roof Repair is confident to say we are accustomed to. We have completed hundreds of commercial projects over the last 3 decades. Our Quality workmanship and craftsmanship can be found in Miami-Dade, Palm Beach and Monroe Counties. Our materials and processes have been scrutinized and always come through with flying colors! You can Trust us with your Commercial Roofing Projects. No matter the size from Small building to Large Shopping Center our Experience and knowledge will shine on every project we handle. 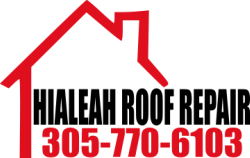 Hialeah Roof Repair's Commercial Roofers are experienced with Metal Roofs, Flat Roofs, Tile Roofs, Shingle Roofs, BUR (Build up Roof) and of course TPO. They have you covered in all areas. Call us today!